As I sit here in London, munching chocolate covered pretzels, my last paean to New York, I am just working out how it feels to come home, to repatriate. Not quite in NW3 yet, we move in later this week, but near enough. The familiarity is good; the accents natural and the food the same as usual. Paddington station was confusing, someone moved the taxi rank and didn’t tell me. No sign of Paddington Bear either, which was a disappointment to J. Taxi cabs are wider, well, they seem wider according to E; and the driver chattier. They’ve got credit card machines in now and I’m sure that’s new. I asked the driver whether most people use cards now. No, he says, mostly cash. I think that may have more to do with the 10 per cent surcharge. New York taxis rides are mostly paid for with credit cards, which is odd that New York should be more advanced, as we found the finance system in the US to be pretty backward in many ways. Starbucks was surreal this afternoon: sitting in an identikit cafe, sipping the same old drink in the same old cups but surrounded by British accents. It is far more expensive than New York. I was just desperate for a decent cuppa as where we are staying the kettle is ingrained with the deposits from the super hard water of London. No water filters here. So it’s really just a slow process of assimilation now. Doing all the boring stuff you do wherever you live, but this time it’s normal, I am normal and my accent is irrelevant. I am not having to learn everything anew. Over time I expect the New York experience to fade and become the ‘can you believe we used to live in New York’ type of memory. Only the photos and the videos; the Fairway’s reusable bags, the Zabars mugs and the love of salty sweet snacks evidence we were ever there. This is my last blog post. Amazingly I have written 312 of them. I have loved doing this blog, it’s been a fun way to record our experience and share it with anyone who cares to read it. It doesn’t matter than you don’t know who I am (unless of course you know me anyway) but hopefully what I’ve recorded is useful, interesting and above all amusing. Someone told me once that I was being ‘snarky’. I think that’s a bit harsh. I may have been occasionally sardonic and often sarcastic, but it’s all done with humour and a layer of exasperation resulting from getting to know another culture. And that’s what this has been all about. And there I leave it. I was nyc-newbie. Categories: Food, General, Taxis | Tags: expat experience | Permalink. This is our final day in New York. E, J and I will travel back to London later today and leave R to do all the fun stuff like packing and handing back the flat. I love our flat so much that I want to pack it up and take it back with us. Luckily I don’t have to see the flat all empty, as it will make me very sad. It is the best place we’ve ever lived; R says it will be the best place we ever live. I think he’s right. The luxury of the expat life has some great perks. Some nice men came round early this morning and took all our air freight, so that’s done. I will leave with just two suitcases, a sports bag and no buggy. J is all grown up now. It is also a very cold day. In fact, I think it may be the coldest day since we’ve been here. It is minus 13 at the moment and over night it got down to minus 17! I was wrapped up to the extent that all you could see was my eyes shielded by glasses. My thighs were the least covered, just in jeans from mid thigh where my coat stopped to mid calf where my boots began, and they were tingling in the cold. They have only just defrosted. I went to the phone shop to cancel my US mobile and went past Fairway’s. No more visits there. It reminded me that Whole Foods is due to open today so I went to have a nose, but I was two days early. Typical, we live here for over two years and then they open Whole Foods two days after we leave. The streets around where we live are pretty grotty at the moment. There are huge chunks of ice everywhere, as it hasn’t warmed up enough to entirely melt everything. But where it has melted a bit, it reveals all the dog poo, the rubbish that people threw in the snow and it’s so dirty. We’re going to the ever lovely Mansion Cafe for lunch and a final round of pancakes and bacon – why does that combination work so well? Then we’re off. Categories: Built environment, Food, Weather | Tags: expat experience, freezing cold | Permalink. The Met: it’s big, it’s famous and it’s somewhere you should go if you visit New York. The Guggenheim: it is curvy, white and cooler than it’s stuffier friend down the road. Go, but be careful of the low walls and the height, not good for vertigo sufferers. MOMA: too busy but I quite like it, just wish they would show more Hoppers. Whitney: this is now closed until later this year as it heads downtown away from its Madison Avenue concrete monstrosity. Holds blockbuster exhibitions and is home to a massive collection of Hoppers, which are of course always lovely. Museum of the City of New York: well worth the slightly further trek up 5th Avenue to see this if they have some interesting exhibitions on. Great chandelier and nice cafe. MOMA PS1: the Queens based little and very cool sister of MOMA on 51st Street. Love wacky art? You’ll love this place but watch out for the quizzical expression that will remain on your face for days when you emerge blinking into the daylight. Queens Museum: staying in Queens, this is well worth the visit, all refurbished and shiny (and right by the relics of the World’s Fair from 50 years ago). Not busy, not expensive but make sure the 7 train is running this far out as it’s super expensive by cab. Bronx Museum of Arts: bit of a trek and not the swankiest area, but for the brave, a trip out here puts you well and truly on the ‘wow, you’ve been there?’ end of the spectrum. No one will have heard of it and you look cool. Central Park: have I written about how much I love it? Empire State Building: not been this time, but R and E did and E recommends a small stuffed seal toy as a face warmer when it’s minus horrendous outside. Statue of Liberty and Ellis Island: see previous posts about going when the weather is nice but no one else has noticed. Go to Harlem: have brunch at Red Rooster and wait for ages for a table; listen to amazing ladies singing gospel a few feet away and then stuff yourself with hearty, carb laden breakfast food. Hang out at the Studio Museum on 125th Street and check out some African American art. Walk the 20 blocks to the very top of Central Park around 106 Street on the 5th Avenue side and gaze at Duke Ellington, way up on a plinth, hanging out with his piano. Get on the A train: sticking with my jazz theme temporarily and go to the Cloisters. This is the Met’s older brother, he is mediaeval. Go on a warm summer’s day and walk through nearby Fort Tryon Park; take a picnic and gaze over the Hudson River to New Jersey. Stop walking around Bloomingdales: wander further along 59th Street to the tram way and glide over the East River to one of my favourite places, Roosevelt Island. I have lost count of the number of times I have been, but I never get bored of the Roosevelt Memorial, it’s amazing. And go to Coney Island, the Blackpool of New York City. There are loads more and most are covered in other blog posts. I shall miss all this discovery, I’ve been to more places in New York in 2 years than I ever did living in London for 12 years. Categories: Art and culture, Tourism | Tags: Visiting New York | Permalink. Here’s my favourite New York lunch delivered to our apartment in about 20 minutes courtesy of a few mouse clicks on Seamless, which is every New Yorker’s favourite delivery service website. Top right – the peak of sushi, the shrimp (that’s prawn to me) tempura (battered) sushi. A glorious mixture of prawns, avocado and crispy batter in a brown rice roll. Yum. 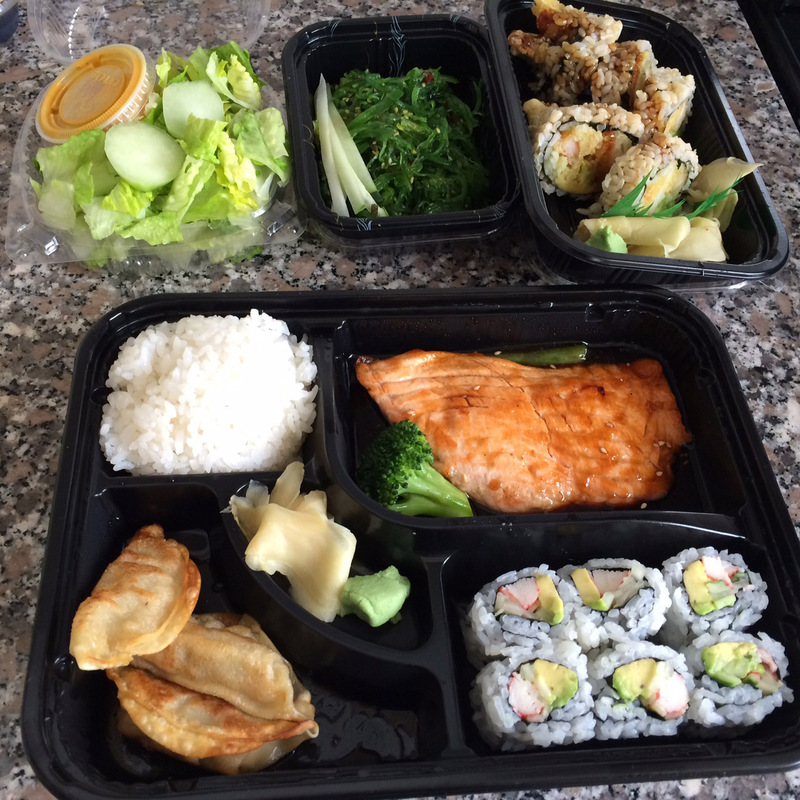 Bottom – the lunchtime $9.50 bento box. Yes, that’s about 6 quid for a pile of rice, big piece of salmon in sauce, some fried dumpling thingies and some less interesting sushi. I didn’t photograph the miso soup because I don’t like it. Too salty. J eats all the rice and most of the salmon and I scoff the rest. What a marvellous way to eat lunch for $27 including delivery and tip (about £17.50). And today is the last time we will have this. I’ll miss you Kobe Sushi on 78th and York. Categories: Food | Tags: food delivery, Kobe Sushi, lunch | Permalink. In our last few days in New York, I have a moment of weakness where I agree to have a goodbye sleepover for E. She will turn 9 the week we return to London, so this is a birthday sleepover too. Most of the people I mention this too say I am quite mad or very brave. I am neither. I organise this with military precision, to include dinner at a local burger place and hours of evening skating in Central Park to wear them out and burn off all the sugar from the calorie laden milk shakes. There is something quite special about skating at night in the sub zero temperature with the buildings of 59th and 5th Avenue looming over head. There are lots of British tourists on the ice, so it’s good to hear some familiar accents. The girls are loud, they are boisterous but they have fun, so much fun. We pile into a yellow cab to go home and they spend far too long chattering in bed before eventually falling asleep. What a great New York way for E to spend an early birthday and remember the lovely friends she will have to sadly leave behind in a matter of days. Categories: Children, Public park | Tags: Birthday, Central Park, ice skating, sleepover | Permalink. R has been nagging me to write about this place we visited before Christmas. If you look at a map of Manhattan and look towards the top of the island on the right hand side you will see a small square of green and the title ‘Crack is Wack playground’. Now that doesn’t necessarily make you want to visit, but being nosey Brits, we went and had a look. Basically it’s a couple of basket ball courts with a huge concrete wall stuck in the middle, separating the two areas. On each side is a mural done by Keith Haring, he of the funky men and bright colourful paintings. He painted the mural in 1986 to “call attention to the damage drugs can inflict on community welfare” (says the NY Parks Dept website). Haring died four years later at the very young age of 32. The mural has somehow survived, it’s been painted over and brightened up over the years, but even now it stands the test of time. I love the shadow of the tree on this photograph of one side of the mural. I don’t have a good photo of the other side, so have a look at NYC Parks website instead. I shall miss all this exploring and discovering the less well known parts of New York. 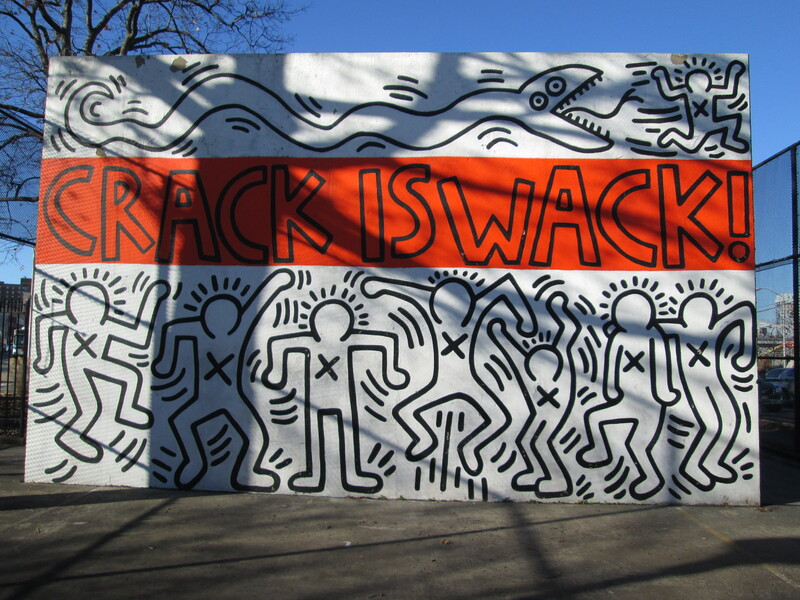 Categories: Art and culture, Playgrounds | Tags: Crack is Wack playground, Harlem, Keith Haring | Permalink. 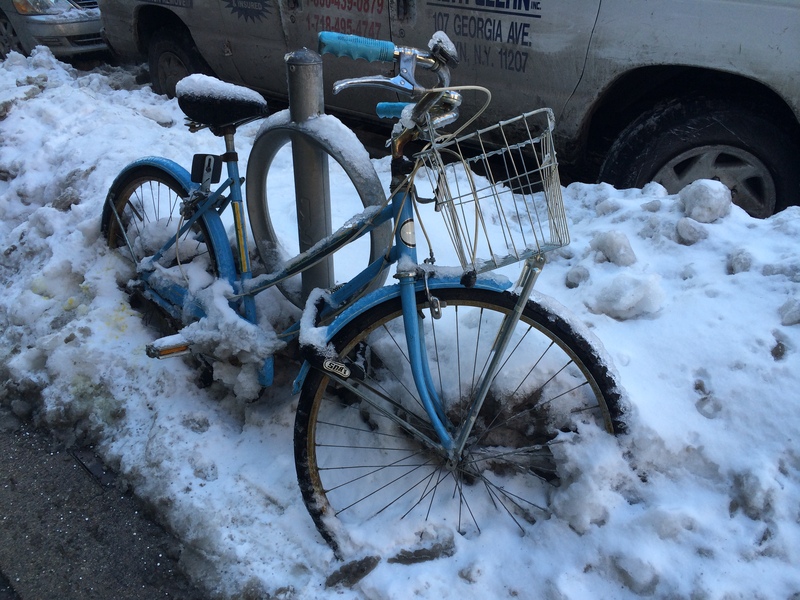 This is how cold it has been and how long it can take for the snow to melt in NYC. Don’t fancy their chances of getting these out for a ride any time soon! 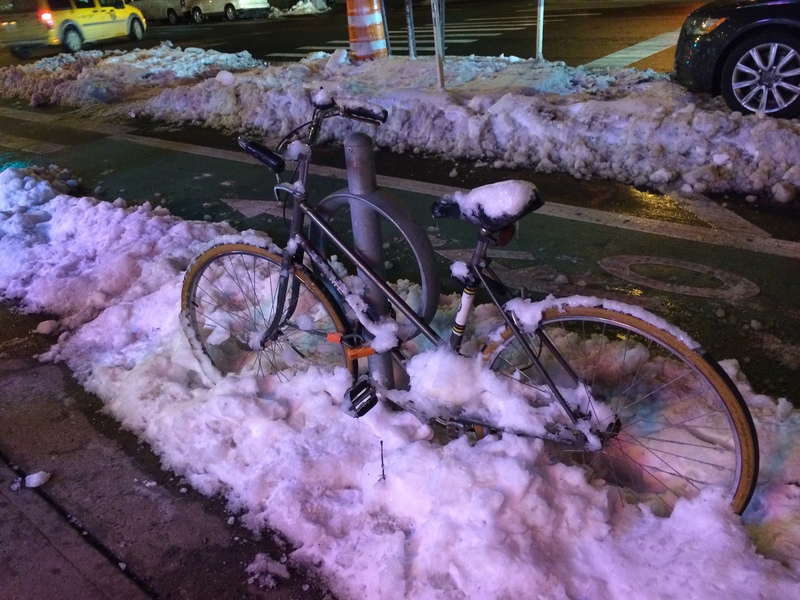 Categories: Weather | Tags: bicycles, cold weather, snow | Permalink. So we’ve done 2 years, 2 months and we have 2 weeks left. There is so much to do, but we have done loads; it feels OK so far. Here’s a glimpse of what it’s like near the end of our expat life in New York. You suddenly realise that living way up high in the sky is amazing and that living in a fabulous apartment building with lovely, friendly staff is just the best. You wonder how you will ever cope with opening the door yourself and consider installing a concierge desk and doorman in your new house. You know everything is ‘the last’, so you make the most of it. You max out on babysitters to go out at much as possible, going to bars and restaurants that you’ve always fancied but never quite managed. You regret not going out more, but hey, that’s OK, there has to be some time to watch the Good Wife and The Blacklist. You remember all the logistics that got you here from London and reverse them. You feel like a pro when dealing with the relocation agents, the shipping people and know all the pitfalls. It’s a nice feeling. You feel complete relief at having sorted housing and schools back in London and feel excited to be going back to what you know, the people you know and that wonderful familiarity. You make sure you can get rid of all those things you can’t take with you and because you have a thing about recycling, find people who will love them after you are done with them. Still can’t find a home for the iron, but you keep on looking. You make time to see all the people you have come to know and go out with them to talk about how great it has been but it’s over, it was always a short gig and yes, you’re happy to go home. This may mask some more emotional feelings, but being British, best kept inside. Ahem. You try to work out how to tell your toddler they are leaving the only home they know and the school they love. Focus on what’s important: the number of the house you are moving to. It’s very important when you are only 3. You help your nearly 9 year old think through the move, what it will be like to go back to her old school, to where she remembers, knows people and feels happy. Enjoy the excitement she feels. You make a mental list of all the nice New York food that you want to take back, just to ease the transition. You hanker after a trip to Sainsbury’s but know secretly you will miss the inconsistent world of Fairway’s. A bit. Categories: Uncategorized | Tags: expat experience, moving home | Permalink. Me: Thank you for my prescription for eye drops, how much is that nice chemist lady? Me: 200 bucks??!!! Really?? What’s in it? Gold? I restrain myself from going into my NHS rant and pay the bill. And today the complete opposite happened. I took J to the doctor and just couldn’t resist sharing my 200 dollar story so she took pity on me and gave me a handful of samples instead of yet another phenomenally expensive prescription and said ‘use those, I get loads’. Ha! Categories: Health | Tags: doctor, drugs, health insurance, prescription | Permalink. So it wasn’t the end of the world, then? Indeed not. The promise of several feet of snow falling on New York City overnight on Monday and forcing its icy grip on its residents just didn’t happen. I woke up yesterday around 6am and peered outside expecting to see snow piled as high as the cars but could see less than a foot. Admittedly from the 35th floor, it’s hard to get perspective on this, but it clearly wasn’t two feet. It was eerie though. Normally the streets and avenues of New York are bustling at all times of day of night. But at 6am yesterday there wasn’t a soul around; the streets were weirdly empty and quiet. It was the quiet that got me. It’s never quiet here.The Mayor had decried that no one should be on the streets after 11pm Monday night. No food deliveries, how would New Yorkers cope? Around 7.30am yesterday the Governor of New York State, Andrew Cuomo, said it wasn’t so bad after all so the subway would start again around 9am, running a Sunday service. Bit by bit the traffic started appearing on the streets and the white roads became their usual mucky colour and it looked fairly normal for a winter’s day. The Mayor said he was right to be cautious and shut the schools, put the 11pm curfew in place, etc. But on this occasion it was an over reaction. He seemed pleased but apologetic for the inconvenience. He would have been criticised whatever he had done. There was, however, enough snow to do some sledging in the local park. It was cold enough to freeze my feet after an hour despite two pairs of socks and some rather unattractive snow boots. J and E had a great time. I was glad to be back in doors, in the warm and feel my toes again. And today, well of course the aftermath was dissected ad nauseum in the New York Times. We didn’t get ours yesterday, so it appeared snuggled inside today’s copy. The kids went back to school as normal; the pavements are slushy and the crossings deep with melted, disgusting dirty snow. I went to Fairway’s and they had a fair bit on the shelves despite all the panic buying. No fish mind you, or my favourite bread, but that’s not so bad when the end of the world has been averted. Categories: Weather | Tags: snow, Winter Storm Juno | Permalink.